I came across a great Japanese market on my walk home from work. Hana Japanese Market recently opened at 17th and U Street in Northwest Washington, DC. It is a great little market that carries almost any Japanese product you could need. They mostly have dry or frozen goods, but they also get local, fresh Japanese vegetables from a Virginia farm every Thursday. They have a wide selection of frozen, sushi grade fish and a wide variety of miso paste. Best of all they are very helpful and knowledgeable! 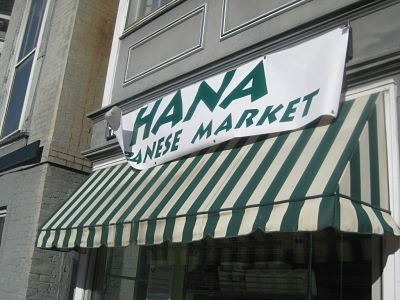 The manager of Hana used to run the Japan Inn restaurant, which was a DC institution. I stopped by the Safeway on 17th street first and picked up some thin steaks. The guy at Hana pointed me towards a great Japanese BBQ marinade for the steak. I also picked up some treats to make the lunches I’m going to pack a little more fun. Expect more Japanese dishes tin the future! “They have a wide selection of frozen, sushi grade fish”. Ok this just sounds all sorts of wrong. Please say they didn’t freeze the sushi grade fish. Duh – Sushi is supposed to be frozen first. Its a misnomer to say FRESH. You want it frozen previously for several reasons. First it is flash frozen at temperatures way below zero, this preserves the integrity of the fish and also kills any bacteria. This also changes the texture and flavor which is what you want. isnt there like a cute little japanese store in there that are for little kids? I know! I am going to have to swing by the library and pick up some Japanese cookbooks. I am definitely going to have to try making some sushi! Their prices for frozen fish are great. I bought some honey panko here but haven’t yet used it. I’m looking forward to picking up some more exotic things and giving them a try!